have had to have extra pages inserted into their passports due to all their stamps and residence permits and such. My sister and I visited my parents for the weekend in rural Michigan about a year ago. One afternoon while it was time for a snack, they said “You guys need to try this, but we’re not telling you what it is. We’re positive you’ll like it. See if you can guess.” They spread a tiny sample of a dark brown paste on a cracker and I took a sniff. It smelled good — really good. Thoughts of Sarah’s family and hometown flooded my mind as I took a bite. I asked, “Is this a chunky barbecue sauce?” “It’s BACON JAM!” they exclaimed. Of course! It’s not a big surprise the smoky, savory, and sweet flavor elements reminded me of Kansas City barbecue. They’d seen an article in the newspaper and gave it a whirl. I searched a little and found the source: Not Quite Nigella, a website I could peruse for hours, if I’m not careful. This recipe is basically hers. Look at her pictures of the process — they’re nice. I’ve scaled it down to 300g of bacon, since our favorite bacon comes in 150 gram packages. Besides, a little of this stuff goes a long way and we really don’t need the full yield, which still turned to be about one cup. Next time I’m going to up the hot sauce and vinegar components slightly for more zing, and add a pinch of salt, since our bacon tends to be less salty than American bacon. In a non-stick pan, fry the bacon in batches until lightly browned and beginning to crisp. You don’t want it fully crispy or burnt by any means. Cut the strips into one-inch pieces. Fry the onion and garlic in the rendered bacon fat on medium heat until translucent, about 5 minutes. Transfer the bacon, onion and garlic into a pot (must it be cast-iron? How so?) and add the rest of the ingredients, except for the water. The original recipe said to simmer for 2 hours adding 1/4 of a cup of water periodically and stirring. But on our stove, even at the lowest burner setting, we lasted only about an hour and a quarter and four or five water addition / stir cycles before calling it quits. I found that the cycles got shorter and shorter over time. It had developed into a thick, sticky paste, reddish-black in color. Nothing smelled burnt, but I didn’t want to push it. When “ready” (as close as you are willing to get to “burnt” without burning it), cool for about 15-20 minutes and then pulse or blend in a food processor depending on how smooth you like it. Refrigerate for storage (I bet it freezes just fine…we’ll see). Makes about one cup. Wait, weren’t you making fun of me for making/eating Apfelschmalz? Also: I’d totally eat that. I have sampled (and enjoyed) Griebenschmalz on occasion. I don’t think I would bag on Schmalzfans, but if so, I apologize. I even tried your horsemeat pizza in Berlin. Hey, wait a minute…are you just trying to guilt me into bringing you some?! 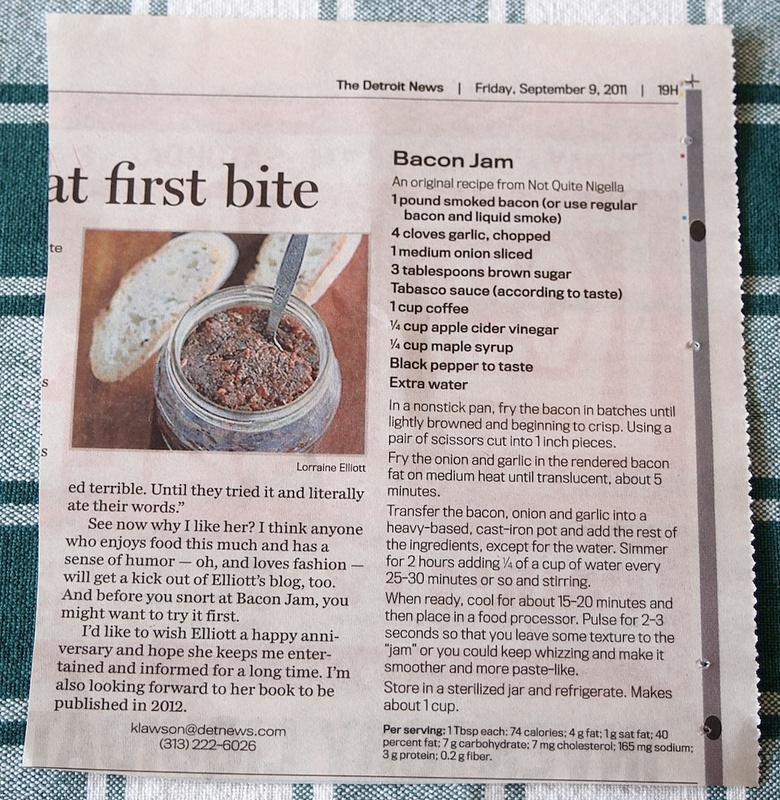 Cliff, I’ve had a recipe for Bacon Jam on my fridge now for about 6 months but haven’t tried it yet. Where did you find liquid smoke in DE? Mentioned you in my blog today, after reading about your Embassy issues – I linked it back to you. Have a great Sunday! We were looking around for quite some time, before I thought to look for it online through amazon.de. I ordered it from a seller called American Soda in the UK and they were happy to ship to us. It was a two-pack of glass bottles and one of them broke in transit, but American Soda was more than happy to refund me half or send a replacement (I took the refund). We originally bought it to make a knock-off of my favorite barbeque sauce from Kansas City. It’s Stubb’s brand and pours horrendously. So if you get it, make sure to have another bottle to decant it into, thereby avoiding frustration in the future. Wow, thanks. I had completely forgotten this! This looks soooooo good. Bacon and jam, two of my favourite things combined. 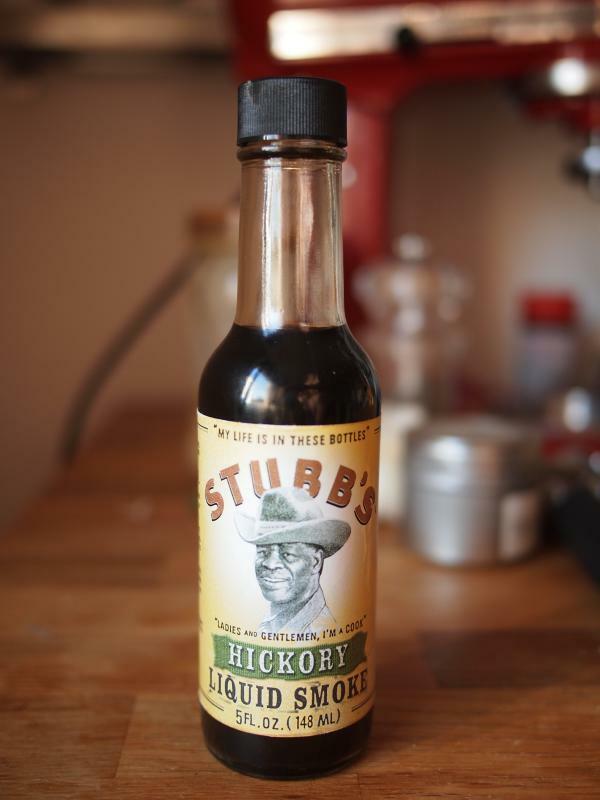 So about that liquid smoke: if I buy two bottles, will they last me the rest of my life? 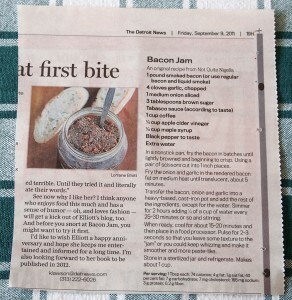 Yes, paradoxically especially if you make enough bacon jam to use them up! Me personally, I’d prefer one bottle of Hickory and one of Mesquite. 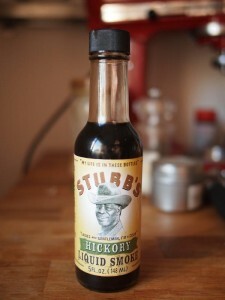 The liquid smoke, combined with pink pickling salt (uhh, where can I buy that in less than a kilo bucket!? ), also expands our smokehouse-free sausage-making horizons. But that’s another meaty adventure in the making. Be still my beating heart! If it’s not Bacon and Jam! Are you sure you’re not promoting artery blockage here? I kid, it looks great and my try it sometime soon!